Design and implement a PV plant on the roof of a tertiary building with smart power management and storage features with the aim to self-consume the photovoltaic electricity, in order to not be any more depending of the French feed-in-tariff; and showing the conditions of a new business model for PV with onsite storage and consumption, applicable more largely on tertiary buildings. Many local community organizations would like to reduce their environmental footprint and produce their own energy, for instance with PV panels. This would also create awareness in neighborhoods and engage people in the transition towards clean energy. In France, the very low feed-in-tariff for tertiary buildings is holding back many of those projects and leaves a lot of roofs unused. ALEC has recently built a new highly energy efficient “Esp’ACE – Air, Climate, Energy – building” in Grenoble metropolitan area that hosts environmental oriented associations, implementing awareness actions towards professionals and citizens. Within City-zen it will demonstrate that there exists a specific business model for PV by combining low cost technologies for flat roof integration of PV panels, consumption of the electricity directly in the building (self-supply), smart management and storage features. It makes sense to set up this innovative plant on the building roof. This building is furthermore representative of many existing or new building that could reproduce this kind of project. The project was completed end of 2017. 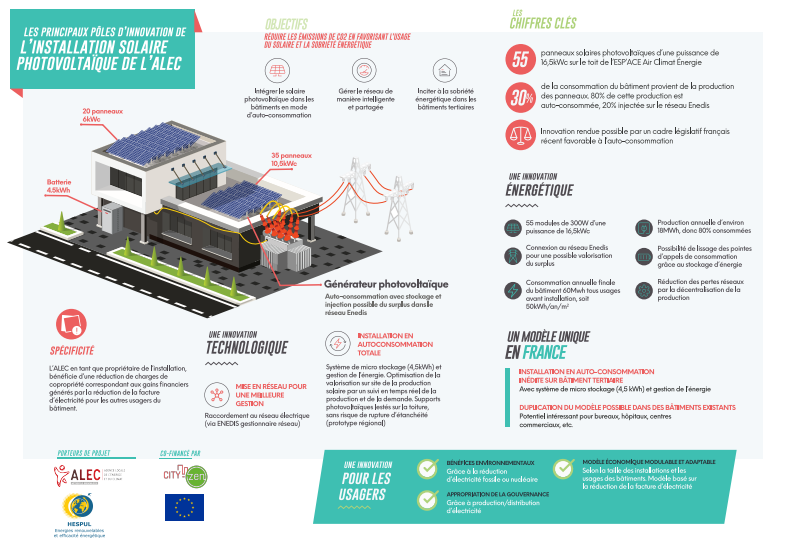 The project will not only allow the partners in Grenoble to benefit from their own renewable energy and reduce the electricity bill, but will also serve as an example to other community organizations elsewhere in France. ALEC disseminates and help in the replication of similar projects. ALEC expose the advantages/limits of different legal/financial possibilities and provide a model for contracting with building users to secure payback to the plant owner. First monitoring trends show very positive results concerning PV production and self-consumption rate, though the storage wasn’t fully operational in 2018. The impact of storage capacity will be fully tested in spring and summer 2019.